The Uniflame Single Panel Olde World Iron Medium sized Fireplace Screen combines luxury and affordability, for a traditional fireplace screen that is a real must have. Uniflame's Medium sized Single Panel Fireplace Screen measures a total of 44 inches in width and 33 inches in height, which is the perfect size for most fireplaces today. It delivers a breathtaking Olde World Iron finish that is eye catching without being too overpowering, or taking away from the beauty of the fireplace itself. 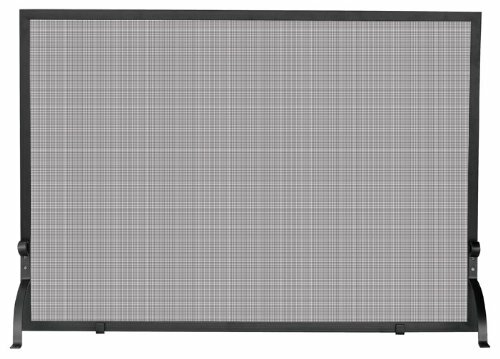 This screen is extremely easy to assemble, and provides a single panel design for simple and convenient everyday use. How deep are the legs from front to back? I would like to know how far away from the fireplace the screen will stand. Actually, the feet located on the back of the screen and positioned more toward the center would not cause the screen to be pushed away from the fireplace opening. These adjustable feet are used to level the screen and would project into the fireplace opening. Are the legs of this Uniflame S-1156 single panel Old World iron screen adjustable? There are adjustable leveling feet that are set inward of the outer legs roughly 6 to 8 inches that will project rearward. Excellent fire screen. Size was spot on, is sturdy built but not so heavy that it makes it hard to move. Light weight and looks great. Keeps the sparks in! This was the perfect accessory to upgrade our fireplace. The shipping was quick as well and we are very pleased with how well it is made. I am fired up about purchasing this fireplace screen! After reviewing a number of models, this was the answer. I love how the classic design doesnt shout at you but quietly and simply sits there, hugging the wall and doing its job keeping the sparks at bay. As you can see, Im very happy and pleased with my purchase. This screen is a great value for your money. The plain design keeps the fire and the beauty of your fireplace center stage. We are very pleased with purchasing this simple, yet attractive fireplace screen that is sturdy and easy to assemble. Even though I keep wondering if it will tip over, this screen has a great simple design, yet is sturdy and made well. The screen looks very nice, but I'm afraid it has some construction issues. The feet seem too big for the frame, and the screws holding them together are much too small. This arrangement may work for a time, but I think the connection will eventually come loose, especially if the screen is moved frequently. This sturdy fireplace screen is easy to manage and set in place snugly against the fireplace surround. It complements and enhances your hearth. If you want a simple screen that will complement your fireplace dor and not detract from it, this is the perfect answer. The customer service for this item was very good. It does not seem overly durable, but it will work well for the time being.